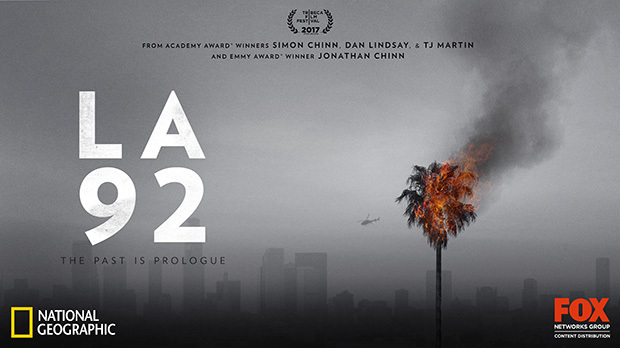 LA 92 is a 2017 American documentary film about the 1992 Los Angeles riots, directed by Daniel Lindsay and T. J. Martin.It premiered at the Tribeca Film Festival on April 21, 2017, opened in theaters on April 28, 2017 and aired on National Geographic Channel on April 30, 2017. Consisting entirely of archival footage, the documentary chronicles the 1992 Los Angeles riots after 25 years have passed. It includes film and video from the 1965 Watts Riots, the 1973 election of Tom Bradley, the 1978 promotion of Daryl Gates, the shooting of Latasha Harlins, the Rodney King videotape and the subsequent riots and violence that erupted after the acquittal of the officers involved in King's beating. The footage includes public pronouncements by U.S. President George H. W. Bush, presidential candidate Bill Clinton, California governor Pete Wilson, chief of the Los Angeles Police Department Daryl Gates (questioned by the LA city council at one point), judge Joyce Karlin, US Congresswoman Maxine Waters, victim Rodney King, and acquitted police officers Stacey Koon and Laurence Powell.